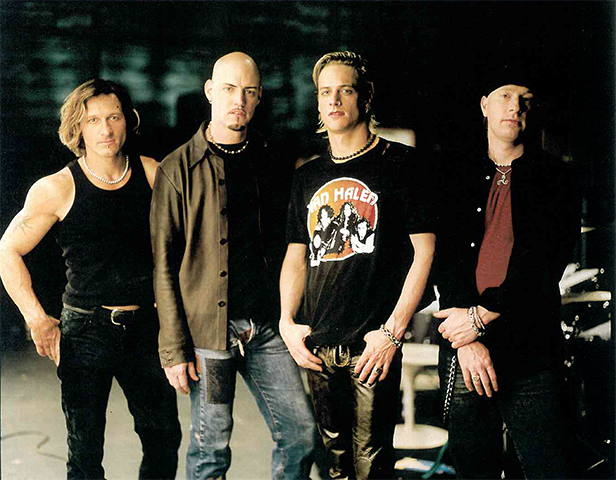 Fuel is an American rock band formed by guitarist/songwriter Carl Bell and bassist Jeff Abercrombie in 1989. Originally known as Small the Joy, they changed the group's name to Fuel sometime in 1994. They are well known for their hit songs "Shimmer" from Sunburn, "Hemorrhage (In My Hands)", "Bad Day" from Something Like Human, and "Falls on Me" from Natural Selection. "The origins of Fuel were formed in 1989 in Brownsville, Tennessee by guitarist/songwriter Carl Bell and drummer Jody Abbott. Singer/guitarist Brett Scallions joined the group after Bell and bassist Jeff Abercrombie saw him in a bar in Jackson, Tennessee in 1993. That same year, keyboardist/vocalist Erik Avakian joined the lineup and the band moved to Harrisburg, Pennsylvania in 1994 where they played at local Pennsylvania bars and nightclubs. Their first EP Porcelain was released in 1996 and sold well locally, spawning a small radio hit with ""Shimmer"". The popularity of the EP brought them to the attention of Sony's 550 imprint, which released their second EP Hazleton the following year. Upon signing to Epic, the band entered Longview Farm recording studios in Massachusetts, along with producer Steven Haigler and session drummer Jonathan Mover due to problems with Abbott. The band's full length debut, Sunburn, came out in 1998. ""Shimmer"" was again included and almost became a Top 40 hit; while, the other singles (""Bittersweet"", ""Jesus or a Gun"", and ""Sunburn,"") received some airplay. The songs ""Shimmer"" and ""Sunburn"" are also featured on the charitable album Live in the X Lounge. ""Sunburn"" was also featured in the movie Scream 3, and the band contributed the non-LP track ""Walk the Sky"" to the 1998 American Godzilla film. The band hit the road in support of the release, but problems with Abbott continued. Once again Mover was enlisted, this time to play drums on tour while the band sought out a full time drummer to join. It should be noted that the liner notes for the cassette and CD issues of ""Sunburn"" list the band members as Carl Bell (guitar), Brett Scallions (vocals), Jeff Abercrombie (bass), and Kevin Miller (drums), although Jonathan Mover is credited with playing all the drums and percussion on the record. The band picture includes Miller, though he did not play on the record."